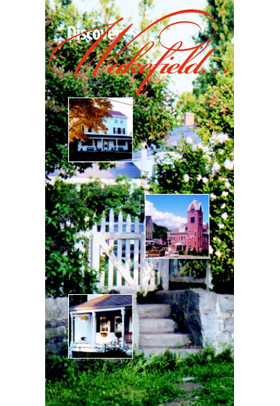 This brochure was created to help promote tourism in the town of Wakefield, N.H. The goal: to create a sense of place defined by history and a commitment to the preserving the past. The community of Wakefield is home to seven villages: Wakefield Corner, Sanbornville, Union Village, Woodman, East, North, and South Wakefield. Some of these places hardly exist anymore, except as roadside signposts. But their names evoke an earlier era, a time when communities were small, when people put down roots. Today, the history of this place remains, cherished by its residents, preserved against a backdrop of natural beauty, for any traveler to discover. . . . The heart and soul of Wakefield lies at the crest of a hill, where two roads meet and the land falls away to the mountains beyond. Here stands the Hay Scale, where the Sealer of Weights and Measures once weighed wagons of hay bound for market, determining the cost of each load. Just a stone’s throw from this once-busy intersection, water still spills from the red and green pump into the granite watering trough that once refreshed the horses who hauled their wagon loads along this ridge and down into the valley. And here, along a short stretch of roadway, you’ll discover New England as you’ve always imagined it: white clapboards and green shutters, friendly front porches and neatly fenced gardens. Time seems slower here in Wakefield Corner, and the past is very much a part of the present. The best way to experience this place is to walk – past the Congregational Church, the Parsonage, the old Post Office, the Wakefield Inn, the old Schoolhouse. Every one of these 26 buildings has a story – and each one is so perfectly preserved that the entire village has been placed on the National Register of Historic Places. When the railroad arrived, the center of Wakefield shifted from Wakefield Corner to Sanbornville, which today remains the bustling retail district of town. In Turntable Park, the restored turntable is a visual reminder of the trains that once connected this New England village to the rest of the world. In the early 1870s, more than 100,000 people passed through every week on ski trains bound for the White Mountains. Downtown, J.W. Garvin’s General Store promised “honest value” to its customers for more than 70 years, selling hardware, fabric, penny candy – and just about anything else you might need. Today visitors stop at the Garvin Building, owned by the Heritage Commission, and discover intriguing bits of Wakefield’s past: an ice saw, a whale oil railroad lantern, and a sign commemorating “The Best Flour in the World,” which was once processed here. The ice cutting operation on Lovell Lake was a mainstay of the economy here during the late 19th century. One hundred railway cars each day were loaded with 25-pound blocks of ice, bound for Boston ice boxes. And the ice house along the shore of Lovell Lake was famous as the largest shingled roof in the world. Go antique hunting along the winding roads of North and South Wakefield and Woodman. Enjoy a quiet stroll along the Heritage Trail, which leaves from Sanbornville’s Turntable Park and includes a pamphlet for a self-guided tour. Or perhaps you’d prefer to pedal. Pick up a book of favorite biking routes at the town hall – and set off for an exploration. In the winter, enjoy snowmobiling and cross country skiing. Or just go for a scenic drive. Never mind if you don’t play golf. Make sure you visit the Golf Course at Province Lake in East Wakefield and take in the sweeping mountain and water view. Other popular attractions include the Museum of Childhood and the Dutch Boutique & Gallery in Wakefield Corner. The Chew Choo Cafe and the Poor People’s Pub in Sanbornville. In Wakefield, there’s something happening no matter what the season. Time it right and you might catch the Heritage Festival, Wakefield Pride Day, the annual Art and Craft Fair, a Bell Choir Concert, or the Annual Victorian Tea. Wakefield is also a great place for supper – any time of the year. Fireman’s suppers, church suppers, grange suppers – every month is busy with community gatherings, complete with good conversation and good food. And you’re invited!